This is a set of 10 flat head screwdrivers made by Bergeon. These screwdrivers are packaged safely and organized in a wooden box. The following sizes are provided in this set: 0.5, 0.6, 0.8, 1.0, 1.2, 1.4, 1.6, 2.0, 2.5 and 3.0mm. Each screwdriver is made of hardened stainless steel with an ergonomic handle for added comfort. The head of each screwdriver is a swivel head which allows the screwdriver to rotate easily without having adjust your hand when in use. Each screwdriver is also color coded for easy organization. The screwdrivers also come with extra blades for each size. 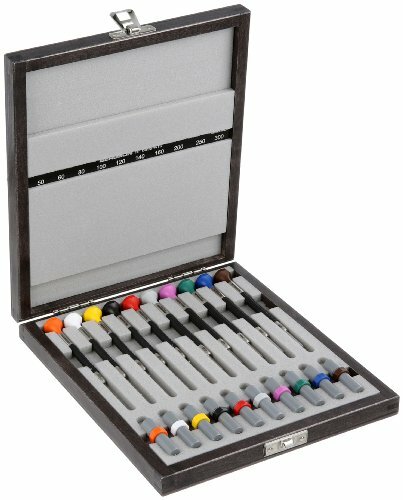 This set is made in Switzerland and is made of the highest quality materials available. The set measures approximately 8.4 x 5.8 x 1.2 inches.